There is something so magical about the Eiffel Tower and the Parisian world it represents... As a lover of languages and culture, I have a special place in my heart for French. Therefore, I was pleasantly surprised on a recent trip to Chapters Indigo, when I found an abundance of cute Parisian influenced items, and many on them on sale! For those of you who are redecorating an office, gearing up for the school year (yes, that's you my fellow French teachers), or perhaps just wanting to add a little bit of Paris to your life, check out the list below! *Please note, this is not a sponsored post. 1 // Bonjour Paris: The Bonjour City Map-guides ~ on sale! 2 // Desk sling ~ on sale! 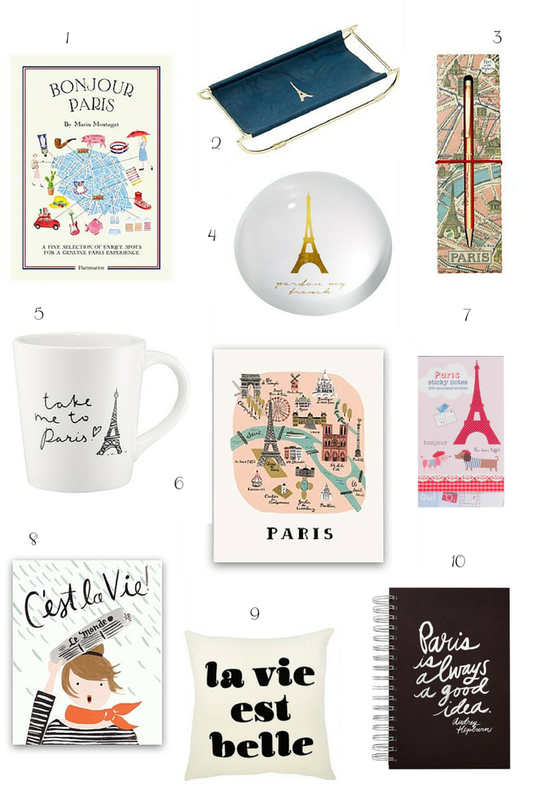 3 // Paris Touchscreen Pen - "Oh la laa"
4 // Dome Paperweight - "Pardon My French"
6 // Paris Map Print - 16x16 ~ on sale! 8 // C'est la Vie Print - 8x10 ~ on sale! 10 // Paris is Always a Good Idea Journal ~ on sale!